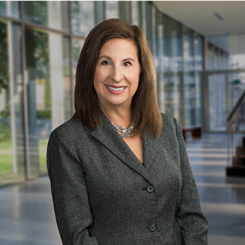 Joyce Edelman is a litigation lawyer with over 30 years’ experience representing clients in a variety of industries in high exposure civil litigation. She chairs the life science subgroup of the firm’s Product Liability Practice Group as well as the firm’s Women’s Leadership Initiative. I graduated from law school at West Virginia University College of Law in 1982 and immediately started practicing with Alexander, Ebinger, Fisher and Lawrence in Columbus. Alexander Ebinger merged with Porter Wright in 1986. What drove you to becoming a lawyer and select your specialty? I wanted to become a lawyer from the time I was a young girl. I wanted to make a difference in the lives of women and girls. To that end, I pursued a degree in Women’s Studies and worked for two national women’s organizations in Washington, D.C. in college. Throughout my legal career, I have worked hard to help promote and advance opportunities for women lawyers and be a champion of diversity and inclusion efforts. I chair Porter Wright’s Women’s Leadership Initiative and our mission is to promote the development of business by encouraging and partnering with women leaders inside and outside of our firm; to encourage the retention and promotion of women attorneys at Porter Wright; and to highlight the diverse and inclusive culture of our firm. I also serve on the Steering Committee of a consortium of five law firms in Columbus that have formed to address issues of gender equity in the legal industry. I am a former Chair of the Ohio State Bar Association (OSBA) Section on Women in the Profession and a founding member of the Ohio Women’s Bar Association (OWBA). I am a proud recipient of the OWBA’s Founders’ Award (formerly the Justice Alice Robin Resnick Award of Distinction) which recognizes outstanding women attorneys who have contributed to the legal profession. I chair Porter Wright’s Life Sciences subgroup of the Product Liability Practice Group. Over the course of my 36 years of practice, I have successfully defended complex product liability litigation for an array of regulated products, including medical devices, pharmaceuticals, dietary supplements, consumer products and chemicals (diacetyl and benzene). I also have extensive experience defending blood banks and plasmapheresis centers in donor injury and transfusion-related litigation. I have defended single plaintiff cases, multi-plaintiff cases, multi-district litigation and class actions as local, regional and national counsel in state and federal courts throughout the United States. I was named Best Lawyers® 2015 Columbus, Ohio Product Liability – Litigation – Defendants “Lawyer of the Year” and Ohio Super Lawyers®, Top 25 Columbus Women Attorneys, for 2018 and 2019. I love collaborating with my clients to help them solve their problems and achieve their business objectives. I love being a trusted partner to my clients and my colleagues and enjoy the relationships I have formed over the many years of my practice. I am equally passionate about making the legal industry more diverse and inclusive. And, I love mentoring younger lawyers. I can truly say that I enjoy all the challenges and opportunities my career brings me every single day! What advise can you share with a client that might need your services? I think all clients should feel comfortable with the lawyers and the firms they retain. In the end, it comes down to relationships and trust. Communication and collaboration are the keys to success. Porter Wright has been my home my entire career because we provide top-notch legal service to our clients while maintaining a supportive environment. I don’t think that clients need to go to the coasts to find amazing legal talent. We have it in Columbus.